Emergence of low cost carriers, growing air passenger traffic on domestic routes, and establishment of new airports have led to the overall surge of Air Traffic Control (ATC) equipment in India. Further, expansion of military air bases across the country, especially at North-Eastern borders have spurred the demand for these equipment. In vertical market, civil aviation held majority of ATC equipment installations. Also, in the coming years, owing to construction of International airports, the market for ATC equipment is exhibited to witness growth. 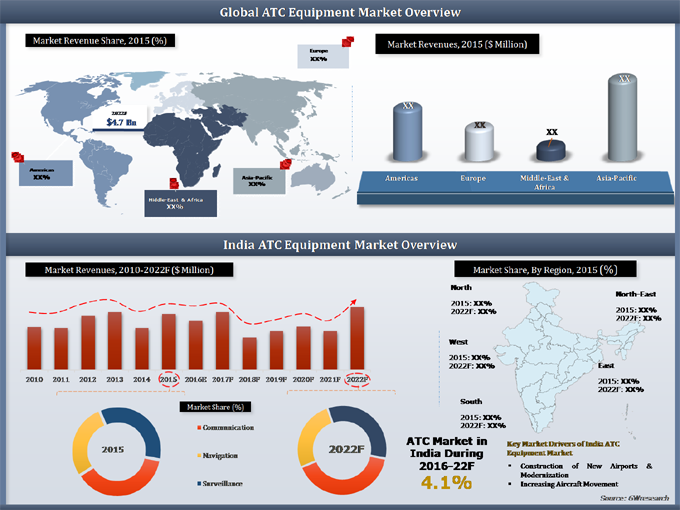 The report thoroughly covers ATC equipment market by types, verticals and regions. The report provides an unbiased and detailed analysis of the on-going trends, opportunities/ high growth areas, market drivers which would help the stakeholders to decide and align their market strategies according to the current and future market dynamics. India ATC equipment market is expected to grow on account of increasing number of civil airport projects. Further, expansion of military airbases across Northern and North-Eastern parts of the country for countering escalating terrorism and cross border infiltration have fueled the demand for ATC equipment in last few years. Communication equipment captured key market revenue share attributed to its wide deployment in almost all type of airports such as domestic, international and military airbases. The report estimates and forecast overall India ATC Equipment market by Revenue & Volume and by Equipment Type, by Verticals and by Regions. The report also gives insights price trends, market trends, company profiles, competitive landscape, market drivers and restraints.